Learn how to draw cute household pets, impressive wild animals and amazing birds using this fun and easy step-by-step method. Starting with simple shapes, four popular artists show how easy it is to develop circles, rectangles, squares and ovals into an exciting selection of creatures including cats, dogs, horses, lions, elephants, monkeys, penguins and eagles. If you have never drawn before this is definitely the book for you, and there is a lot here to inspire more experienced artists too. Uses material from the How to Draw series. 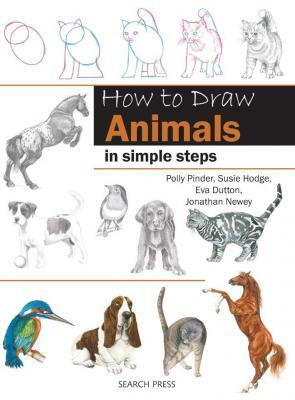 Over 130 step-by-step drawings A fantastic selection of popular animals and birds Easy methods and great result. Eva Dutton is a professional artist and qualified riding instructor (BHSAI) and stable manager (BHS). She studied fine art at Norwich School of Art and has spent many years combining her love of painting with her professional equestrian work. She currently works to commission and exhibits widely. As well as her love for horses, she has a passion for wildlife and the landscape. She is now painting wolves and other creatures as well as farm and domestic animals. Eva is a member of the Society of Equestrian Artists and she is currently working full time as a professional artist and illustrator. She lives in Shropshire.